Joey Jones - Shakes his fist - LFChistory - Stats galore for Liverpool FC! Bob McCluskey. who organised my meeting with Joey, told me when we drove in at Wrexham's training ground that the first thing Joey would do was to offer us a cup of tea. 'He's such a genuine fella.' Sure enough, in we go... 'You want a cup of tea?' is the first thing Joey asks. Joey coaches the youngsters at Wrexham Football Club, where he has been for "donkey's years" on and off since 1971. He arrived at Liverpool in 1975 where he spent just over three seasons. He returned to Wrexham as a player, but signed for Chelsea in 1982, winning the Second Division title there. Joey couldn't sell his house in Wrexham so he travelled from Wales to London, almost every day during his three years at the Stamford Bridge club. While at Liverpool Joey featured in a century of games and was a crowd favourite. Why were you so popular with Liverpool fans? It's not going to be because of my football skills, is it? I used to stand on the Boys' Pen and ended up standing on the Kop. I appreciated playing for Liverpool Football Club because it was a boyhood dream of mine playing for the team I supported. All I could do was go and give 150%, not 100%, 150%! I think the fans could identify with myself in terms of: 'If Joey can do it, maybe we can do it as well.' Maybe John Aldridge was that type as well. He used to watch Liverpool and ended up playing for them. Maybe the boys could see what the club really meant to me. They could certainly identify with your enthusiasm, although sometimes misplaced enthusiasm. Funnily enough, I work with young lads here at Wrexham and I always say to the lads: 'Listen, the one thing you got to have is the big E-word.' They look at me and say: 'What's the big E-word?' 'Enthusiasm. It's a big word. I can't spell it, but I've got plenty of it. I want you to have the same. If you have got enthusiasm and you've got the ability to go with it you'll get yourself noticed.' If you look at all the top players Liverpool have had over the years, King Kenny, Rushie, Hansen. They're there, because they work hard. A Kopite wrote: "I love Joey Jones. Always remember him dancing in a middle of a game when we were singing his name." The ball was out of play, though! [laughs] Was it the time they asked me to do the pogo? I remember it, yeah. Sometimes I did things a modern footballer wouldn't do. I never distanced myself from the fans. I was only a fan on the pitch. I always like to be remembered like that. It turns out Joey was appreciated by his teammates as well on and off the field according to Ray Clemence in 1977. "Joey just loves to be happy and gets enthusiastic about the slightest thing. He’s just the sort of player every team need, because he’ll make you forget those tensions with one of his terrible jokes. He makes a joke about anything and everything." When growing up in Wrexham Joey used to get in all kinds of trouble. I was very lucky not to be sent away to what would be for young offenders at one stage because of some of the things I used to get up to back home. We weren't robbers or nothing like that. We would go out on Saturday night. We were called the "Bad Gang Parrots." As daft as it sounds we were bloody well known down the coast. We would have other gangs coming in just for punch-ups. I would be playing in the first team here in Wrexham coming back on Mondays with black eyes and everything. I didn't need drink to get me going. I was nuts anyway. Did Liverpool's approach came as a shock to you? I joined Wrexham out of school, at 15. I was fishing and when I came back off the boat (it was only a bloody little rowing boat!) I saw my dad standing on the beach. I thought something must be wrong here. What's he doing? We didn't have a phone. The Wrexham scout, Evan Williams, had come around the house and banged on the door. He said Liverpool had been in touch with Wrexham. 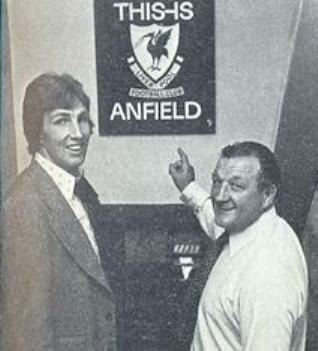 Bob Paisley was going to come around that night. It was a Saturday night. My mom is from Dingle, the Toxteth area. My dad's mother was a Scouser as well. The Liverpool connection was all there. We waited in for Bob Paisley to come. He never came around. It was the next day when the Wrexham scout got the call again. 'They want to speak to you in Chester.' We never had a car. We got a lift off my dad's mate and went to Chester. Met the chairman and Bob Paisley. 'We want to sign you for Liverpool.' That was all I ever wanted in my life. They offered £100 a week. I was on £65 a week here anyway. If they had offered me less than £65 I still would have signed for them. Within 5-10 minutes I had been in and had a cup of tea I said: 'I'll sign.' Next day I went to Liverpool and signed and trained in the afternoon. Did you know that Liverpool were following you? Not really. If I am being perfectly honest I never expected to go any higher than Wrexham. At that time it was a Third Division club. If nothing else I had made a profession out of what I wanted to do. I was obviously doing something right because there was quite a number of scouts coming to the games. It had been reported Everton were interested at one time. Before I went to Liverpool I was going to go in a part-exchange with a player called Len Badger. He played for Sheffield United. They were going to swap me for Len Badger and £100,000. It fell through and I wasn't that disappointed. Not long after the Liverpool move came about. To hear the Kop singing your name. It was something I never expected. When Liverpool signed players from lower divisions 98% of them went into the reserves and then the first team. I did the opposite. I went straight from Wrexham into the first team. I didn't have that settling-down process of going to play in the reserves. In many respects I was playing on adrenaline. Eventually it caught up with me in that first season. After about 15-16 games I started to dip. I was used to play for Wrexham and used to watching Liverpool. I was actually on the pitch with my heroes... with players, believe it or not, I had pictures of on the walls in the council house in Llandudno, back home in the bedroom I shared with my brother, who is a big Liverpool fan. He's got Liverpool tattoos everywhere. I now find myself in the dressing room getting changed next to them. Eventually it caught up with me. I went into the reserves and it was the following season I got a more regular place. I don't care what anybody says. It is quite daunting. The first time I really heard the Liverpool fans chanting my name was on my debut against Queens Park Rangers where we got beat 2-0. I actually ran back and made a goalline save. It was behind the goal I first heard the Liverpool fans chant my name. Doesn't that give you the buzz? My next game was midweek, my home debut against West Ham. I ran out at Anfield and I remember the Kop chanting my name. Because I knew where I used to stand and I knew where my mates were, my cousins, I was putting my fist up to them, not to cause trouble. Eventually as my career moved along, that got me into trouble at various clubs. The opposition thought it was to cause trouble. I used to put my fist up here at Wrexham if they chanted my name but it wouldn't have the same impact because we didn't have as many fans. By the time I had gone to Chelsea I got arrested a couple of times... for "inciting riots." I was arrested at Derby County. I got arrested at Newcastle. All of a sudden it was me causing all the trouble yet when I was at Liverpool I didn't get arrested once. Do people still shake their fist at you? Yeah, they do. I get embarassed really. It is nice to be remembered for something. I have never professed to be anybody I wasn't. Joey was on the bench when Liverpool won the UEFA Cup at the Olympic Stadium in Bruges as well as when the Reds faced Barcelona in the semi-finals. It was a memorable occasion for many reasons. When the 1976/77 season started Jones was back in the first team and only missed three of the 42 league fixtures during that memorable campaign. I was lucky enough to be in a Liverpool team to win the European Cup for the first time, to win the league title and to play in an FA Cup final. All in one season. That was the best season I ever had in football club-wise and I was in the Welsh team that beat England at Wembley against so many Liverpool players who played in that team as well. That was the best year ever in football for me. Joey's performances in the European campaign inspired the legendary banner that will always be a big part of his career. It doesn't matter if it's Liverpool fans or Manchester United fans or whatever... they all remember the banner in Rome. People say: 'They made that banner about you, didn't they?' It was the ultimate compliment really because when you look at that Liverpool team that played in Rome in 77... All the German players would have known everyone of the Liverpool team but they wouldn't have heard of me. When you are playing with the likes of Keegan, Tommy Smith, Emlyn Hughes, Ray Clemence and Ian Callaghan and they made a banner like that...that meant everything to me. It was a great compliment to walk out and see that great banner by the Liverpool fans. I had that banner presented to me when I left the club and came back to Wrexham. I had the banner for twenty odd years. I kept it at home. They only place I would let it go back to was the Liverpool museum. Although they gave it to me I still think it's a fans' banner. I've had numerous offers for that banner. I said: 'I wouldn't sell that banner. It's not my banner.' It's nice to be remembered for the banner and that's why I let it go back to the museum. Joey's autobiography: "Oh, Joey, Joey" was published in 2005. The book was refreshing in the sense that Joey is very modest and straightforward. He was clearly not talking through a publicist. I never ever wanted to do that book. I'm not that type of person. Do you remember Rob McCaffrey? Rob is big mate of mine and he is a big Liverpool fan. When he was working on the radio he used to come to Wrexham every Sunday and say to me: 'Why don't you do a book, Joey?' 'I'm not interested in doing a book. Who would be interested in reading about me?' He would start taking notes down. He got a job on the TV so basically it was all typed out but left in an old suitcase in my house on the loft. Pete Young said: 'Do you still got the manuscript for the book?' He had done books locally. Some of the lads want to have a look at it.' I said: 'I'll dig it out at some stage' and I let him have a look at it. He said: 'There's a story there that a few people would like to read. Eventually we said: 'Let's have a go at it.' I said: 'If I do a book I am not going to do a book where I am going to be criticising that person. That's not my style. If I have got stuff to say I say it to their faces which I have done. If it's going to be a book about my life I have to be honest about it. I know It sounds a bit daft but since it's been out I haven't read it. It's not that I don't want to, just I haven't had time to read it. I have loads of biographies at the house of different people. Once you were at Liverpool with plenty of strong personalities around you had to go in and show that you weren't going to be pushed around. You got into a punch-up with Ray Kennedy. It was brewing for a while. We used to sit on the bus. There was an old cassette deck you used to put on and I used to listen to old songs. I would say: 'This is for you, Cally! ', mucking about. I always remember Ray saying to me one day: 'Turn that off.' Because of what I was like and where I am from I turned it up louder. To cut a long story short. We were playing in the north-east somewhere and we stopped for a fish and chips. I got back on the bus and Phil Neal was just sitting there and Ray got on the bus and said something to Phil in terms of: 'Don't leave me in there again on my own.' I always remember Phil saying: 'Ray, I only went for a piss and got back on the bus.' He said: 'Don't leave me on my own again' and he belted Phil. Phil's head hit the coach window. And again... Maybe I am stupid but I said: [pardon my welsh...] 'Fu****** hell, Phil, hit him back!' Ray said: 'Would you hit me back?' and I went: 'Yeah, I would.' By that time the lads had come on the bus and pushed Ray to the back where he used to sit up with his legs up. The following Saturday we were playing Manchester City. I am left-back and Ray is left-midfield. We always go away on a Friday to a hotel. We had the team meeting and I was doing a bit of shadow boxing with Kenny. I remember standing on somebody's foot and I looked around and it was Ray. He was built like a heavyweight. I was probably built like a bantamweight. I remember I said: 'Sorry', but Ray said: 'I warned you before.' I thought: 'I know what's coming now.' Being brought up where I was I had always been told and it was the only wrong advice my dad ever gave me: 'If you think somebody is going to hit you, don't hang around, belt him.' I used to take that sometimes on to the pitch. So I banged him. I hit him twice and we end up in this brawl. I remember Bob Paisley saying: 'Both of you can leave the club.' Obviously he thought more of Ray than me because it was me who left [laughs]. It got split up. Ray started issuing threats to me of what he was going to do to me. Once the red mist is... I wanted to finish it off. That's the type I was. He could have killed me. It got broken up and quietened down for a while. We were playing small-sided games at Liverpool and they put me and Ray on the opposite team. You've got to bear in mind all the supporters are there at Melwood. Ray Kennedy has got the ball and as I close him down he hooked me right across the nose. I jumped on his back. You have got to picture this. I have got one arm around his neck and I am punching him but he's swinging me around and my legs are going around. Apparently that is the only time that training got stopped at Liverpool. We had a dinner and I know it sounds stupid. I am not advocating this by any means but I did say: 'I'll just stab you, mate.' It was stupid. They had to take the knife off me. It was a blunt one, anyway. I went home to get myself ready for the night and had to check in at the Bootroom and say: 'I am here.' I've gone into the Bootroom and Joe Fagan and Ronnie, Roy and the boss was there, Bob Paisley. I remember him saying: 'Have you calmed down now?' 'I went 'No. If in fact if it carries on I am going to finish it off.' The door opens at the player's entrance and it is Ray Kennedy walking towards me. I've got my bag here. If you can imagine music, High noon. Here we go. I thought, 'I better put the bag in the left hand because I know I am going to smack him with my right one. He puts his bag down and I threw mine down and he went: 'Listen Joey, I am sorry.' He apologised and we didn't have any problems after that. We became mates after that. The condition he's got now.. it might have been part of that coming on... but me and Ray were big mates after that and it happens in all clubs all over the country. He was unbelievable. How he doesn't get recognised more I don't know. Bill Shankly was a great manager, as was Matt Busby, Jock Stein and I remember a programme being on about them three and I wondered why wasn't there a programme about Bob Paisley. I can only speak on him because he managed me. I was a fan of Bill Shankly when he was manager and I know all the history. Bob Paisley was a very simple man and a great man. He was never over-complicated. Now they have sports science and a person doing nutrition, one doing the tactical side and one doing the statistics. I always felt that Bob Paisley, Joe Fagan, Ronnie Moran and Roy Evans were ahead of their time. They were doing that long before this all became fashionable, but in a simple way. He could speak to you properly and guide you in a way, but I wouldn't say we practiced the tactical side. What Liverpool did was that they got players who fitted into the Liverpool Way and they just carried on. They would guide you more than tell you what to do. You were left to make your to make your own decisions. Liverpool at that time had great players. Them players didn't need any coaching. Don't get me wrong, I wasn't a great player. I knew my limitations, because Bob Paisley often reminded me about them. You couldn't help but to be successful being in a team with them big players. Were there no specific instructions? Sometimes he would say: 'You can go up for a corner today.' Another time: 'Stay back.' Free kicks... We never used to practice anything. They did it off the cuff. I used to laugh sometimes. You see them on the telly and then they have the commentary. 'Oh, that one has come off the training ground.' What training ground? That just came off his head. You have said you most enjoyed putting in a solid tackle and hear the groan from the crowd. Yeah...I used to love that. I try to tell the lads here... A good tackle.. 'That just gave me a hard on that.' That was part of my game. I wasn't like Tommy Smith, but I had my strengths. I must have had some kind of strength otherwise they wouldn't have played me. I could head the ball and probably win the ball back. I love seeing a good tackle. That's why I love Tommy Smith. People used to go and watch the skilful players. I used to go and watch players like Tommy and Billy Bremner. It's much as a skill as passing the ball. And it gets neglected and it doesn't get the praise that it should do. I say to our young lads. You probably hear them say about such and such a player: 'He's a great passer of the ball.' and then they say about someone else: 'But he can only tackle.' For him to be able to pass it he got to have the fella who could tackle. Why don't they say? : 'He can only pass the ball' and 'He's a great tackler.' In the coaching courses you go on... we have all had to do our badges. They never put any sessions on about tackling. They put sessions on heading, passing, running with the ball, all the tactical stuff, but where are the sessions about tackling? Joey was out of the first team from March 1978 onwards and left in October. Did the club want to get rid of you because of some trouble like they did Jimmy Case later on? No, they didn't want to get rid of me because I had just signed a two-year contract. You didn't leave because you elbowed Paisley in the face? I punched him, that's what I did! It was accidental. I loved him like a father. It was a complete accident, but I didn't play for Liverpool after that! It was at Chelsea, an FA Cup tie. I had been switched to right-back to mark Clive Walker. They thought I could mark wingers better than Phil Neal. We got battered at Chelsea. I hadn't had a good game anyway. Clive Walker scored two. You can still see it on Youtube. I felt I was no worse than anybody else. I was always really critical of my own performance, maybe too critical. I didn't feel I was any worse than anyone else on this particular day, but I got substituted. I remember the boss Bob Paisley throwing the tracksuit at me, 'Put that on.' Obviously, I was agitated and sweaty and had few problems getting it on. I couldn't get my head all through the neck. As I was sitting there struggling then all of a sudden my hand went straight through the sleeve and I felt my fist hit somebody's flesh. As my head came through I could see the boss rubbing his face. To this day I don't know if it is whether I punched him in the face or played crap that I never played for Liverpool again after that. The following season I left. In hindsight I should have stayed. I was very hot-headed. I wanted to play. I was 24. As much as I love Liverpool and I do I don't want to be in the reserves. I want to play first-team football. I was also playing international football then and if I wasn't playing in the first team there that's going to effect that as well. I said, 'I wanna' go then.' Deep, deep down I didn't want to, but I wanted to play First Division football. When I look back at it now maybe I should have stayed, hung on there and give it a go. But, I wouldn't change what I have done in my life. Good, bad or different, that's the way it is.